We have entered winter, the most yin season of all. The energy of winter is slow, quiet and reflective, and so is yin yoga. Yin is a slower, more passive yoga style, which encourages you to drop into stillness. 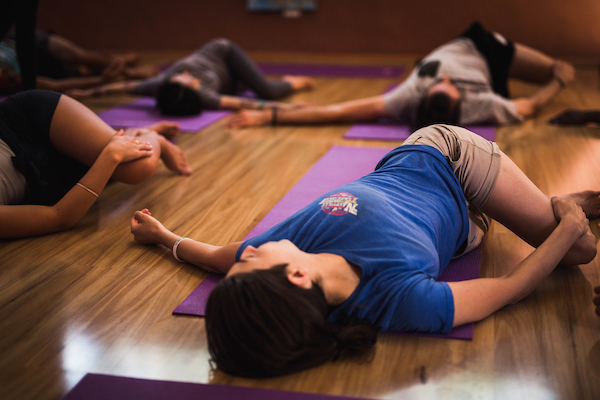 In yin yoga, you hold each pose for 3-5 minutes, letting gravity and your breath do the work. All you need to do is stay with the pose and allow yourself to receive the precious gifts of awareness, expansion and peace. Here are five reasons why joining a yin yoga class will help you thrive this winter and beyond. In winter, we move less and hold our bodies tight, trying to keep every bit of warmth inside. As a result, we get stiff and less mobile. Yin yoga is a wonderful way to stretch deeply, grow your flexibility, loosen the tight spots and increase your range of movement. The structure of yin yoga requires that you slow down and be present to everything that you feel. When you feel your emotions fully, without fighting them or judging them, they will eventually find their way out of your system. After your yin yoga class, you’ll experience greater peace and clarity, and problems from your daily life will not seem so overwhelming. Research participants reported significant reduction in stress levels after just five weeks of practicing yin yoga, and these results stayed with them even after their participation in the program had concluded. Because you are holding each pose for a long time, it’s important to find the right depth for you. Some discomfort is normal, and it will often ease after a few deep breath into the tight areas, but if you feel any pain, then you’ve gone too far and you need to readjust or stop. With practice, you’ll become better at interpreting your body’s signals and you’ll be able to use these skills in your daily life. While you’re holding the pose and feeling uncomfortable, you might think, ‘I want to stop now’ or ‘I can’t hold this anymore’. You’ll notice your thoughts and you’ll realise that, no matter what you think, you can stay with the pose. Next time these same thoughts come up outside the yoga studio, you’ll recognise them and you’ll know they are just thoughts. They are not necessarily true and you are the one who gets to choose whether to act on them or ignore them. Yin yoga is a deeply individual practice. During the class, your instructor will remind you to look inward and not base your choices on what anyone else is doing around you. Yoga teaches you to be kind to yourself and to appreciate your body just the way it is. This kindness and appreciation spreads towards everybody else in the room. We are all different, yet, at a core level, we are all the same. We all long to belong and we create connection by practicing yoga together. Come and join for winter yoga in the Blue Mountains. Our yin classes are on Wednesdays and Sundays. Article written by Tatiana Apostolova: A freelance writer and a mum of three living in Sydney. She is passionate about holistic living, yoga, creativity and travel.